Buildings lining the “Grand Boulevard and Concourse”represent a variety of architectural styles, including Art Deco and Moderne structures. 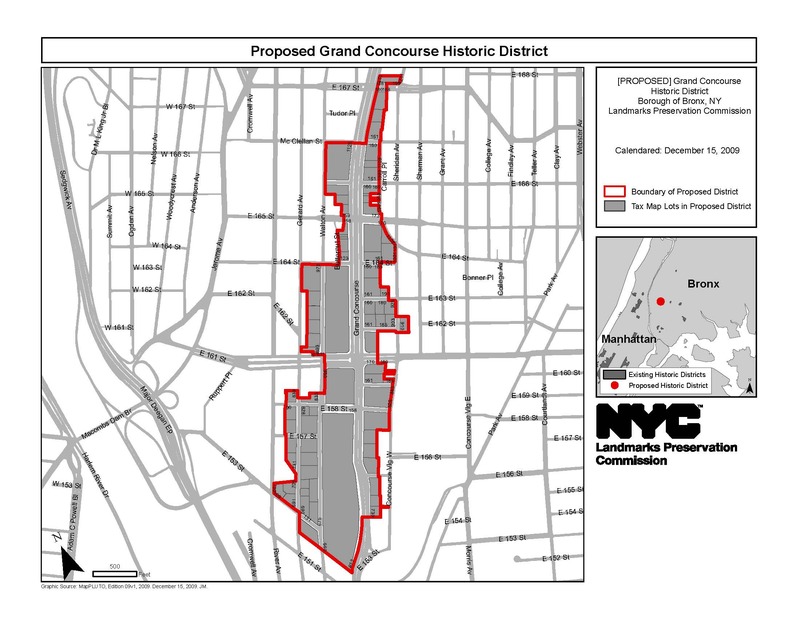 On December 15, 2009, Landmarks moved to calendar 73 properties along the Bronx’s Grand Concourse, the first step toward designating the proposed Grand Concourse Historic District. The proposed district would include a section of the Grand Concourse between East 167th and East 153rd Streets and properties along Walton Avenue, west of Franz Sigel and Joyce Kilmer Parks. Significant structures within the proposed district include the Thomas Gardens apartments, the Concourse Plaza Hotel, and the Bronx County Building. Although Landmarks did not hear public testimony at the meeting, Chair Robert B. Tierney noted that Bronx Borough President Ruben Diaz Jr. had submitted a letter strongly supporting designation. Tierney did not set a date for the proposal’s public hearing. LPC: Grand Concourse Historic District, Bronx (LP-2403) (Dec. 15, 2009).